In 1969, the Kingsmen, Columbia’s traditional a capella group, gambled on a new concept. At a Wollman concert, “The Glory That Was Grease,” the Kingsmen, outfitted in gold lame and sporting Elvis Presley hairdos, performed original dances while singing classic Fifties rock ’n’ roll. That led to a memorable “Grease Under the Stars” concert on Low Plaza, soon after which they shot to stardom, opening for Jimi Hendrix at the original Woodstock Festival. Renamed Sha Na Na, they became regulars at Fillmore West and East, appeared in the Oscar-winning Woodstock movie as well as the movie version of Grease, which their act had inspired. Their syndicated TV show ran for years, worldwide. So Columbia’s place in rock ’n’ roll history has long been granted. Recently, however, there has been an interesting new level of appreciation. 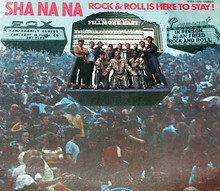 Contemporary scholars of American cultural history have begun writing that Sha Na Na’s greatest achievement was the invention of a new American era: the “Fifties.” The whole notion of how artists can change the way a historical era is viewed, and relatively quickly, is interesting on its own; the fact that Sha Na Na and the College played such a role in this change makes it interesting for all Columbians. Brothers and founding members George J. Leonard ’67, ’68 GSAS, ’72 GSAS, who conceived and choreographed the Kingsmen’s change to Sha Na Na, and Robert A. Leonard ’70, ’73 GSAS, ’82 GSAS, the group’s first president and gold lame singer, report on the new scholarly interest in Sha Na Na. In the last few years, an unlikely group of scholars has been studying Columbia’s Sha Na Na as a test case: meta-historians, theoreticians of cultural history itself. In 2004, Rutgers University Press published a bold new book by Goucher professor Daniel Marcus, Happy Days and Wonder Years: The Fifties and Sixties in Contemporary Cultural Politics. In 2006, Elizabeth E. Guffey, a Stanford Ph.D. and associate professor at SUNY Purchase, published Retro: The Culture of Revival (London and Chicago: Reaktion Books distributed by the University of Chicago Press, retrothebook.com). Both books contain extensive studies of Sha Na Na’s “Fabricated Fifties” (Guffey’s term) because Marcus and Guffey — working quite independently — discovered Sha Na Na and Columbia College, in 1969, playing an unusual role in 20th century American history. More precisely, in inventing it. Guffey quickly spots that Sha Na Na was “subtly infused with Camp. George J. Leonard, the group’s leader [in matters of theory], described himself as a ‘22-year-old Susan Sontag buff.’ Recalling the group’s transformation from Ivy League glee club to television stars, Leonard spoke of a ‘vision of a group that would sing only ’50s rock and perform dances like the Busby Berkeley films that he ‘learned to love in college readings on Camp’ ” in Richard Kuhns’ aesthetics courses. Then, Marcus and Guffey saw, around 1969, “history” had been deliberately rewritten — almost invented. “The replacement of the Beat with the greaser as the emblematic 1950s rebel” had, Marcus reports, consolidated its hold on American “memory” within a very few years, by the time of Happy Days and Fonzie. Nor had that replacement gone unnoticed, Guffey discovered. “People begin to remember the 1950s not as they recall them but as they have been re-created for them,” Horizon marveled by 1972. “This is what makes the newly-minted myth of the Fifties so remarkable … .” “Vision fades and imagination takes over,” Time critic Gerald Clarke wrote. Marcus uses the term “1950s” for the actual decade, and “Fifties” for the “newly minted” myth (a useful device we’ll adopt). The Fifties, then, had rather suddenly replaced the 1950s in the collective memory. Though Happy Days and the musical Grease had played a role, Marcus and Guffey both found articles such as Horizon’s, which predated those works. Tracing back, Marcus discovered, as Guffey had, that the new Fifties was no older than Columbia College, spring 1969, when the Kingsmen put on two shows: “The Glory That Was Grease” and the “First East Coast Grease Festival,” attended by 5,000 students from Massachusetts to Maryland. That had been the first appearance of the word “Grease” and the first appearance of the greaser, who, Marcus saw, rapidly replaced the popular image of Beatniks and the Beat era. “This ascription of the social domain and style of hoods (in 1950s slang) or greasers (as they came to be known in the 1970s) as the emblematic experience of 1950s youth came to be a common trope in later media discussions of the era” (pp. 12–13 ff.). The Fonz, then, when he first appeared on Happy Days, a full five years later, had only “completed a process of cultural redefinition that had begun with Sha Na Na — that the prototypical figure of youth culture in the Fifties was the urban, white, male working-class greaser. [The Beatniks] were superceded by mainstream interest in the greaser” (p. 30). With surprise, Marcus reports that “Sha Na Na, the first and most successful” of the Fifties redefiners, were not, as he had supposed in his youth, “‘juvenile delinquents from Queens … The band was actually formed,” he reports with amazement, “of Columbia College students, many of whom were classically trained … ” (pp. 12–13). For 37 years such weird little incidents have been material for rock trivia contests … but for theoretical history books from major scholarly houses? But Orwell’s villain said that, not Orwell. The simple idea that “history is written by the winners,” is giving way to the realization that history is, of course, written by the writers; and that’s often quite a difference. The Sha Na Na greaser, it turns out, has an unexpected Old World cousin: the Scottish Highlander. So one understands the American meta-historian’s interest in the parallel test case at the College. The invention of the American greaser, swaggering in his gang’s motorcycle jacket, as the Noble Savage of the American Century was a direct parallel to the Romantics’ tough Highlander swaggering in his clan’s tartan — as invented a tradition, alas, as the kilt. The “Highland Flings” were as ersatz as “Fifties dance,” George’s transparently College mix of camp Busby Berkeley movies seen at the New Yorker and Thalia revival houses, with Chuck Jackson’s routine from the Apollo, a relatively short walk from his dorm room, 629 John Jay. “As Voltaire noted,” Guffey observes in Retro (a word she has theorized and made her own the way Sontag captured and theorized Camp), “History does not change, but what we want from it does.” The Columbia test case supports Voltaire. Columbia College, in 1969, wanted something new from the 1950s, and its reasons were well-documented. “Band members linked their success to a disillusionment with radical politics a year after massive student unrest at Columbia,” Marcus writes (pp. 12–14). During the revolution the year before, the Vietnam-era culture wars had escalated into fist fights, even mob fights, between the “jocks” and the “freaks” (and even “pukes”), as protestors were called. We remember professors John D. Rosenberg ’50, ’60 GSAS, Arthur Danto ’53 GSAS and Richard Kuhns ’55 GSAS linking arms in a human chain of faculty members to block the Tactical Patrol Force from clubbing student demonstrators. Kenneth Koch stopped his poetry class from rushing down from Hamilton to join in a brawl between jocks and freaks going on below by crying out, like a WWII movie heroine, in his campiest voice, “Stop! WE’RE … what they’re FIGHTING FOR!” His students broke up laughing, sat back down and Koch went on with the lecture, while the jocks and freaks punched it out outside. After Woodstock, Sha Na Na founders John “Jocko” Marcellino ’72, Don York ’71, Rich Joffe ’72, ’93L, Scott Powell ’70 and manager Ed Goodgold ’65 gained the talents of Jon “Bowzer” Bauman ’68 and “Screamin’” Scott Simon ’70. Their popular television show joined with Happy Days and Grease popularizing the new myth. By the 1980 Presidential election, America had embraced the dream of the Fifties as a pre-political Golden Age. So much so, Marcus painstakingly shows, that the American political landscape was altered to take advantage of this invented cultural memory. In Ronald Reagan’s time, Marcus documents, politicians began invoking a Columbia College fantasy as if it had been history, and trying to ally themselves with it. “Conservatives [in the Reagan Era] parlay(ed) the cultural nostalgia for the Fifties that had circulated in the 1970s into the basis for a political offensive … ”(p. 58). Marcus describes in detail how Bill Clinton fought for parity by casting himself as a worthy descendant of Elvis. Baby Boom politicians have battled during four presidencies over who was the genuine heir to a Fifties that was itself a kind of artwork. We admire the way that Guffey and Marcus accurately deduced, from imaginative research, the 1969 Kingsmen’s conscious intent to invent a Fifties that would reunite Columbia’s shattered, polarized student body by having them relive together their roots. Writing this essay, however, recalled our attention to Hobsbawm, Trevor-Roper and hard-line cultural historians, such as Jean Baudrillard (popularized by The Matrix) who (unlike Guffey and Marcus) at the least, imply that people like us have “invented” history out of whole cloth. The “invention of history” is a topic about which we can speak with odd authority; we know we, at least, did not invent history, we selected it. That’s a great difference. On stage, the careful choice of songs by music directors Al Cooper ’71 and Elliot Cahn ’70 constructed a new montage of the Fifties, based on the plots, themes, recurrent character types and musical emotions already contained in the music. The resulting Sha Na Na Fifties myth was not, therefore, “newly-minted” — only newly-selected. The Columbia test case, then, suggests that even “he who controls the present” can still, at best, only select from the past. Looking at the skies, we deliberately drew lines between new stars to create a new constellation. But we did not, could not, create the stars themselves. The past too exists, even though we select from it. In the past 13 years, George J. Leonard ’67, ’68 GSAS, ’72 GSAS has sold three of his early novels and their screenplays to Universal Pictures, Hollywood, most notably to director Ron Howard. Meanwhile, his books on Asian culture and avant-garde American art are widely cited. He has taught at Yale and is professor of interdisciplinary humanities at San Francisco State (www.georgeleonard.com). Robert A. Leonard ’70, ’73 GSAS, ’82 GSAS became one of the founding fathers of forensic linguistics; Kathy Reichs, best-selling author/producer of the novel-and-TV series Bones, based the character of her heroine’s mentor, Rob Potter, on him. Rob, like his character, flies around the country helping solve murder cases, while doing cameos in movies reminiscing about Jimi Hendrix and holding down a steady job as professor of linguistics at Hofstra (http://people.hofstra.edu/faculty/robert_a_leonard).